Notes:: Using an FT1000MP HF Radio with a 5 meter Vertical antenna, ChromaPIX v 1.6.17 for SSTV TX/RX. QTH Locator is KM17vw. 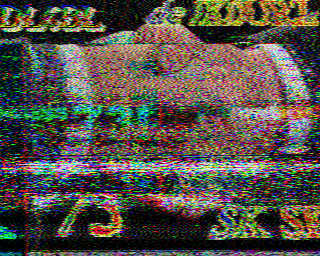 For my personal SSTVCam WEBsite goto http://www.qsl.net/sv1uy/sstv_rx.html . Contact info: sv1uy @ yahoo.com Disclaimer: This SSTVcam usually runs unattended, therefore we are not responsible for what other people transmit on the air. If you do not agree with this, please do not allow young children to look at the pictures!